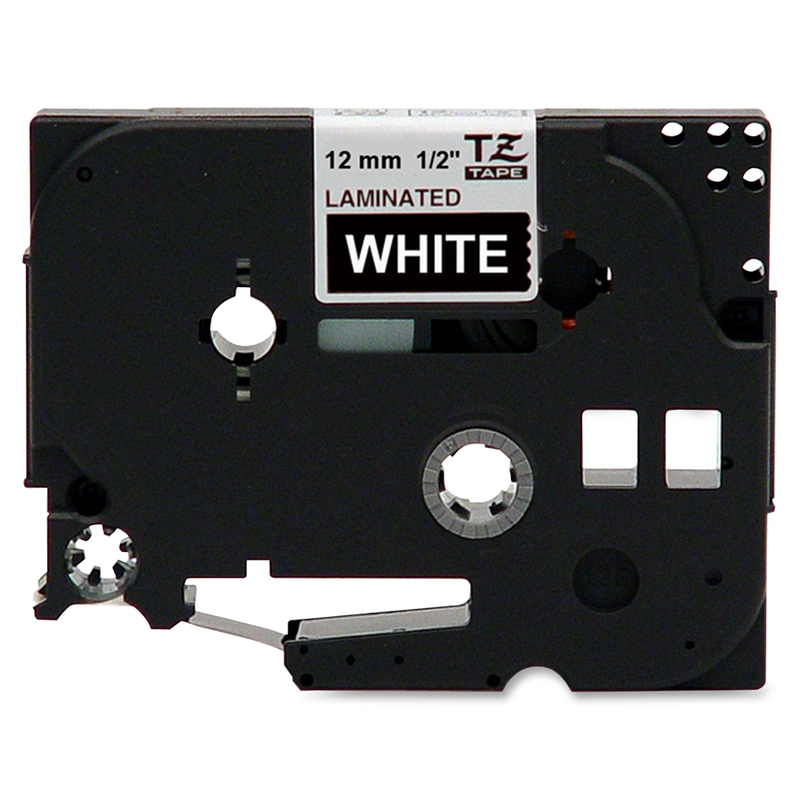 Laminated tape features standard adhesive designed for smooth, flat surfaces like office paper, file folders and binders. These labels stay on under normal indoor and outdoor use, including hot and cold environments. 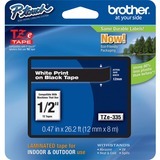 Use with Brother P-touch Labelers using TZ or TZe tapes. They include PT-D200, PT-1280, PT-1290, PT-1830, PT-1880, PT-2100, PT-2110, PT-2030, PT-D400AD, PT-D400VP, PT-D450, PT-H300, PT-H300LI, PT-2430PC, PT-2700, PT-2710, PT-2730, PT-2730VP, PT-D600, PT-D600VP, PT-H500LI, PT-P700, PT-P750W, PT-200, PT-1000, PT-1100, PT-1100SB, PT-1120, PT-1130, PT-1160, PT-1170S, PT-1180, PT-300, PT-310, PT-320, PT-1300, PT-1700, PT-1750, PT-1800, PT-1810, PT-1900, PT-1910, PT-1950, PT-1960, PT-540, PT-580C, PT-1400, PT-1500PC, PT-1600, PT-1650, PT-2200, PT-2210, PT-2300, PT-2310, PT-2400, PT-2410, PT-530, PT-550, PT-3600, PT-9200DX, PT-9200PC, PT-9400, PT-9500PC and PT-9600. Print color is white. Background is black. Tape measures 12mm (8/17") wide x 8m (26-1/5') long.